This is a sub-page of the Aleppo University Attack page, to give space for examining the physical evidence. Only one trail is visible, appearing only partially, perhaps tracing only the projectile's final dive. The plume is viewed from the SSE, looking NNW, 346 degree heading. The trail nearly follows this line of sight, suggesting a point of origin app. 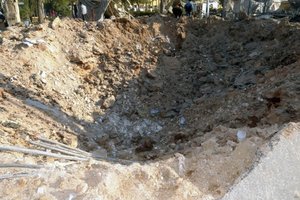 348 degrees (NNW) from the blast site. 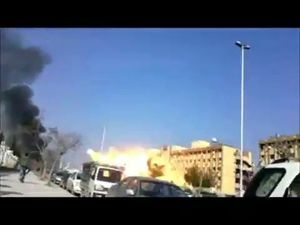 The detonation is quite fierce and massive, enveloping much of the facade of the 73-meter long building and rolling over its roof six floors up. The smoke plume after seems to be very high, and rolls up with much energy. We can't yet make much of a case from these clues, but here's a space just in case. None yet known of, but a space just in case. The first impact reportedly came about three minutes before the second, recorded one - so around 12:48 PM, +/- five minutes. It seems to have impacted the street, in or near a traffic roundabout just north of the stricken dorm. The following graphic, rotated 90 degrees (north indicated) shows the approximate placement of both impacts. The second strike, further south, is more estimated, but the first impact is fairly well established. As illustrated in images on the discussion page, and shown above, this seems to be located in the southeastern part of the roundabout, at the corner of the block containing the dormitories. In fact, the outdoors camp for displaced Aleppans seems to extend right up to this corner, filling the fenced area north of the dorms housing thousands more. (see also image 10 below). Hypothetically, the shape of this impact crater can tell us the implied trajectory, but we're no experts and the clues sem somewhat mixed. The details will be discussed on the talk page until they're ready to paste here. Image 2: damaged vehicles and the dorm behind, looking SSE. The second impact has been timed by shadows as occurring at 12:51 PM local time, +/- four minutes. This time, the impact was seen, against the west face of the northwestern-most dormitory building in the block of 20 such buildings. One thing about the damage that's noteworthy is how hard it is to determine just where the missile hit before it detonated. Everything looks more like the damage of blast shock wave, with no clear hole where the worst happened. The ground is the largest surface that's fairly hard to miss, and just by odds the most likely impact point. It would seem to be very close to the building's facade, however - not in the street, but on the sidewalk or narrow front yard -a space about 20 meters wide, occupied by an improvise shelter for displaced people overflowing from the dorms. This seems to effect mostly the central stairwell and the facade just south of it. The inset shows damage to the railing on three floors, and outer-wall removal effecting at least five floors, widening at the bottom. Also, the facade seems pock-marked for a bit south of this zone. Image 2: flipped vehicles and the dorm - blast is suggested in the space between. Image 7: Early view, fires inside, a dead victim in the foreground. A Facebook photo from February 15 showed the dormitory completely repaired within a month. This page was last edited on 31 October 2016, at 11:40.